So its 7pm, Dec 31, 2008, 5 hours until the New Year. The kids are freshly bathed, in their New Year's dresses and excited to receive their New Year presents. New Year is a big holiday for us and its a very good time. The feast has been well prepared by Natasha and her Mom, visiting here for the holidays. So we'll have our traditional New Year's Feast, declare New Year to take place at 10 pm for the kids, watch 2009 come into town at midnight with the kids tucked in their beds. A quite family friendly night, that's for us. 2008 has brought quite a number of changes and challenges - political, economic and familial. All in all it was a good year, could have been better but no use complaining, and it could have been worse so no worries. So happy New Year to you and yours and may it be a peaceful and successful one for you. May 2009 be better than 2008. You can see footage of Gaza operations on the Israeli Defense Forces YouTube channel. Go get 'em IDF, good luck, and may God bless you all and may you send the terrorists to their just desserts. Also, its not too late to make a donation to the Friends of the IDF and do some good and get a charitable deduction on your taxes for 2008! I visited the doctor this morning before work and there's some decent improvement - the eye is seeing normally again. On the downside there's a bit a scaring he wants to treat but it looks like the infection is gone and the corneal tear is healing pretty well. It still feels like there's a bump on the eye but that will hopefully go away with further treatment. At least I'm down to only taking 1 drop three times a day rather than three different drops. Typically its the suicide bombers attacking Israelis. Failing to be sucessful in that, now that Israel has a security fence and is activly preventing these terorrists from reaching civillians and taking military action against Hamas in Gaza, they atttack their fellow arabs in Iraq no less, while they are protesting and condemning Israel. One civilian was killed and 16 were wounded when a suicide bomber blew himself up when he rode his bicycle into the middle of an anti-Israeli demonstration in the city," local police Major Wael Rasheed told AFP. Talk about your ironic target selection. In Michigan, not so much. Snow stops 'em from delivering mail quite nicely. On Friday, as I blogged before, we had a wicked storm with blowing winds and dumping over a foot of snow. No mail delivered to my street that day and I have no complaints, I wasn't about to go out in that either. Saturday our street wasn't plowed...but the day was clear - no mail. Monday our street wasn't plowed...but the day was clear - no mail. We went to the Post Office and picked up some mail and were told that until the Oakland County Road Commission plows the mail does not get through. Ok our street does have the hill from hell, and as they don't plow it, it gets a nice sheet of ice and you need to take a running start from the end of the street to get to the top and onto the main road unless you have 4 wheel drive, but what about the mail must go through? Can the mail person get out of the vehicle at the top of the road and deliver it on foot? Nope, as the post office related its a vehicle route they by rule will not get out to do deliveries and until the RCOC plows its no mail. Sure enough there was no mail. There was also no plowing. Finally nature intervened with this lovely snow melt and mild temperatures, melting the road ice sheet and lo, there was mail delivery again, and it was good. But a cherished myth of Post Office dependability and reliability is sadly dashed however. Snow does stop the mail. I just received this from SOG Inc as a Curio and Relic. In my humble opinion, its the best value in curio and relic firearms at this time. Designed in Czechoslovakia by the famous Ceska Zbrojovka (CZ) company to be the military sidearm in 9mm Makarov caliber for the Czech army to replace the CZ52, its a very impressive firearm. It has a 12 round double-stack magazine, double action / single action operation with ambidextrous safety and magazine release and truly excellent three-dot fixed sights for a military firearm. The trigger pull is nice and smooth in both double and single action. It is one of the first pistols fielded with a polygonal rifling barrel - making it seem to almost be smoothbore at first glance as there are no traditional lands and grooves visible. It is a blowback firearm, with a fixed barrel that gives impressive accuracy. It is easy to field strip and clean, following the Walther PP and Makarov take down procedure - make sure its empty, pull down on the trigger guard, pull the slide all the way back, lift the rear and gently slide the slide off the frame. Remove the spring from the barrel and there you have it. Easy to clean and reassembly takes place in reverse order. Size wise, it has a 3.8" barrel, is all metal, weighing 28 ounces. It is small enough to disappear in a front jeans pocket, even with the double stack grip. It is very ergonomic and comfortable. Accuracy was very good indeed hitting coffee cans with aplomb out to 50 yards in low light while holding a surefire light. No failures to function, just a nice smooth trigger and it went bang every time. With it being in 9x18 Makarov, with a decent hollowpoint like Hornady's XTP, I'd have no problem carrying it as a nice compact Concealed Carry firearm. Mine has the standard Czech military black paint baked on finish. It has some definite character wear - some scratches, some wear points on the grip but mechanically is perfect making it a very nice addition to my collection. Mine has a stamp indicating it was made in 1985 and has a Czech military acceptance stamp - a nice piece of Cold War Eastern European history. The pistol came with 2 12 round magazines, a lanyard loop, cleaning rod and a huge ambidextrous holster that holds the pistol, spare magazine, cleaning rod and lanyard in a very clever design - great for military use, useless for CCW as its real big. In short this is a can't miss purchase for the Curio and Relic FFL holder. It is also a decent affordable choice for a self defense CCW pistol for those on a budget who can shoot well. 9mm makarov ammo is readily available, relatively inexpensive and effective in capable hands, and the CZ 82, with its negligible recoil, excellent ergonomics, capacity and accuracy make it a perfect platform for the cartridge. I'd highly recommend the CZ vz. 82. Update 1/24/09 I had an opportunity to take the vz.82 pistol out to an indoor pistol range and shoot it at some targets in decent lighting conditions. Feeding was flawless, including firing 25 rounds of the Hornady XTP hollowpoints. Accuracy was ridiculously good, tearing the X out of a target at 7 yards in a very tight group. No real recoil allowed for very quick shot-to-shot times. Over 225 rounds through it and not a single problem. To say that I'm pleased and impressed with this purchase would be an understatement. There's a reason I haven't been blogging. Last Thursday, I began a trial couple hours away in Port Huron. It turned into a 16 hour day with 2 hours of travel to and from, and a return to the office at night to get some prep done before returning to trial expected to begin on Friday morning. A snowstorm was predicted for Friday morning. So Thursday night I get the car ready, make sure all the fluids are at the right levels, get the car packed with all the trial stuff, and go to bed with a slight eye ache. I suppose its just eye strain from a long day and long drive in darkness to and from the trial. I get up around 5, shower, down a quick breakfast and get the Jeep out and hit the road. Its already snowing - heavily. No lane markers remain visible, everything is a nice sheet of white and its still coming down. The eye hurts some more. I press on, getting to the highway in 4 wheel drive. The snow gets worse, speed is down to about 30, visibility 10 feet and dropping. Its not getting better. I keep on going but the visibility keeps dropping, cars are skidding wildly, some already in the ditches. In the time so far I've gotten just about a third of the way, less than what it normally takes to get half the way there. I call the partner on the file and let him know the score, he's on a different highway heading there and wants to press on. Since the conditions and visibility are nearing zero I decide I'm done spinning for the day, let the partner know that I'm not willing to get in a wreck for the client as that will not help anyone, and try to reach the opposing counsel, after a while I reach him and we agree to adjourn because we're all in near zero viz. I call the court and leave a message and then begin the adventure in returning home. The snow is blowing so badly I can't even see the highway off ramps, I finally make one and get home in an hour, using the caution sharp curve yellow signs to let me know I'm still on the road. I get home, talk with the court who finally gets in around 9:30 and they're happy to cancel as the Court is closing at 11:30 due to the bad weather so its just as well we didn't try to keep making it there - we would have been stuck there with no trial to be had. We schedule a new date and go from there. Oh yeah, the eye is now hurting quite a bit. I take out contacts, put some drops in and get on with working from home as I'm done driving for the day and the street is totally snowed in and the snow keeps blowing making any thought of getting out ridiculous. Still no eye relief, I keep the drops flowing, try a cool compress, ice and even finally advil with no relief. Finally Saturday morning I'm almost doubled over in pain with the sensation of red-hot needle being shoved in my eye- "Honey, it's time to visit the emergency room - NOW." So we drive over, with the road not yet plowed in my trusty jeep, get to the ER with almost no waiting, and I'm in a fair bit of pain. They do some more checks, I'm sure my vision is fine but when they check it the eye isn't seeing much at all - this begins to be worrisome. They look at the eye with the equipment and some dye and find out I've got a torn cornea. They figure it happened while I was photocopying Thursday night- some toner or staple fragment got under the contact lens and my eye was so strained I didn't feel it as it tore the cornea. The doc then gives me one drop of tetracaine in the eye - lovely stuff, it numbs the pain and makes it a bearable ache in the eye rather than a constant stabbing pain. But then the doc tells me it will only last a half hour and he won't give me more as it could make it worse - I consider grabbing the eye drop bottle that is just in arm's reach and making a run for it but better sense prevails. The doc prescribes an antibiotic drop, says to take Advil regularly and keep the eye shut in the dark, no reading, no tv, no computer, no nothing and to get an appointment with an ophthalmologist immediately. So I stay in a dark room, dealing with the aches by popping Advil and taking the antibiotic drops on schedule for all of Saturday and Sunday, bored beyond belief, but catching up on my sleep and listening to a book on CD when I'm awake. On Monday I go to the eye doctor and he confirms the situation, gives me another drop to take and wants me back on Tuesday - no reading, tv, computer, driving nothing. Obviously, work is out of the question - a lawyer that can't read, drive or use a computer is not a lot of help around the office. I do some work over the phone. On Tuesday I go back and the eye seems to be responding well, he prescribes another drop that I should start to take in three days as due to the holidays he won't be in, and off I go. Now he tells me I can keep the eye open but no reading, computer, but I can see TV if my eye is up to it in small amounts, and then slowly add reading and computer over time. So now its Sunday and I've been able to do a little TV watching, a little computer and a little reading, all with breaks and the eye is a lot better vision wise. A lousy thing to happen over the holidays but I'm getting through it and it seems to be healing up decently, i'm off the Advil and just doing the drops. Its still achy, I've got lots of stuff to do piling up at work and another eye doc appointment tomorrow. Got lots to blog about including a visit from Lagniappe and his keeper, finding out that snow WILL stop the mail, and other goodies, but it will have to wait as I need to take a break after typing all this. Yes we've all seen the video of an Arab reporter cursing President Bush and throwing his shoes at him (and missing from 15 feet away). Throwing a shoe at someone is considered a grand insult in the Arab world, apparently even sitting with the soles of your shoes facing another can be taken as insulting. This of course makes this shoe throwing coward with bad aim a hero in the Arab world. Very typical. The Iraqis were shamed because when the Americans came and liberated them from Saddam Hussein it happened so quickly and easily, - the Arabs couldn't do it themselves. They certainly wouldn't have thrown shoes at Saddam - they would have been fed feet-first into a plastic shredder by Saddam's minions. Heck they even beat Saddam's statues with shoes once he had been removed from power. This "brave" reporter's act was an act of weakness and pathetic, not to mention lousy aim. Now once the real threat of death is gone for making a political statement and Iraqis are free to vote for their own leaders, now this guy decides to be brave. Sort of like a bully that only picks a fight when he knows his opponent will not fight back. His fellow Arabs and the leftists here (see the lovely lefties' comments online to the Detroit Free Press report of the story) think he's all that now. Everyone else calls him a coward, and with bad aim at that. Don't try this at home or on the range - a 9 is not the same as a 9. He's darn lucky the pistol didn't a) blow apart into pieces ripping his hand into shreds and/or b) send the slide flying off the frame, ripping back toward him at high velocity. It's a testament to the design strength and quality of the Hungarian FEG PA-63 pistol that he got away with it that time, the next time he may be far less lucky. The 9x18 Makarov is designed to work in blowback pistols, ie the action is kept shut by the weight of the slide and spring until the pressure drives it open. 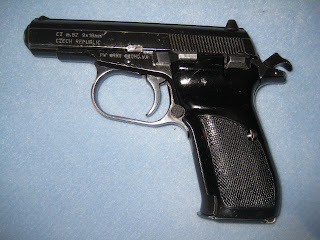 The 9x19 (otherwise called the 9mm Luger, 9mm parabellum, or 9mm NATO) is designed to work in recoil operated firearms, where the action is locked together until fired when at a certain point under recoil the parts unlock and separate with the slide moving backwards to eject the case and reload the barrel. Simple -- it's the pressure difference. The pressure the 9x18 Makarov generates when fired is about 23,200 psi. The pressure the 9x19 Luger generates when fired is about 35,000 psi. 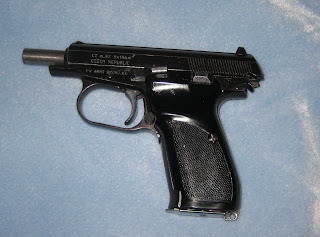 The PA-63 is a blowback pistol designed for the 9x18 Makarov, it is not designed to take the pressure from a 9x19 Luger, a cartridge designed to be used in recoil operated firearms. You'll notice the action when this fellow loads the pistol with the 9x19 does not even fully close, leaving the brass exposed. This is known as firing a gun out of battery and it is a great way to blow the pistol up, likely inflicting serious injury on the hand holding it as well. When the bullet does not properly fit, it's a signal that it's time to quit. There are lots of 9mm cartridges out there, and while they often sound alike, they are not interchangeable. (Yes the Soviets did design the 9x18 Makarov pistol to fire the 9x17 aka .380 ACP in exigent circumstances, but its not going to be very accurate, and the 9x17 is a lower pressure cartridge than the 9x18, and just because it can doesn't mean you should, the Soviets have a much lower value assigned to their troops than you hopefully assign to yourself). 9x17, 9x18, 9x19, 9x21, 9x23 are all different with very different operating pressures and even bullet sizes. Do not interchange them and do not put a high pressure round in a pistol designed for low pressure blowback operation. Never force a cartridge into a firearm's chamber. Use only the same caliber the gun is designed for (and marked for on the slide). If it doesn't fit it's time to quit. If brass is still showing when the cartridge is loaded something is wrong - stop, do not squeeze the trigger, unload and figure out why its not working properly, the hand you save will be your own. "I'm not just the president of the firm, I'm also a client." Seriously though, kidnapping in Mexico is getting way out of hand, and probably isn't going to help their image for tourism any. Hopefully, Mr. Batista will be released safe and unharmed. As Detroit continues to decline in size, more and more of the city is becoming "de-urbanized". Detroit, where the population peaked at 2 million in the early 1950s, is home to about 900,000 today and is still losing people. The depopulation and demolition of abandoned properties has left the city dotted with thousands of vacant parcels, ranging from single home lots to open fields of many acres. The article then on to give suggestions from "experts" of turning these current wastelands into urban farms (as long as they're not corporate of course), parks etc. Instead how about some real vision? These areas, or large contiguous areas, should be removed from the purview of the Detroit City Council and Mayor's office and turned over to a Detroit Township, an entity separate from the City to be created and start over. This would get rid of the in-built corruption that has brought about this desolation, remove the crippling city income and high property taxes that affect these properties and make a chance to start fresh with new leaders, new residents, new businesses, and new ideas. Otherwise Detroit will be left with this unused wasteland while the current leadership dithers. The City of Detroit created this problem, and they're not going to fix it, so its time to take the abandoned areas away and start over. Time for Fair Tax in Michigan? Right Michigan has a very interesting article on the Michigan Fair Tax proposal. The proposal is to end the current State income tax of 4% and take the state sale tax of 6% and raise it to 9.75%. It also gets rid of the business income tax, which would make the state more attractive for business and of course, jobs. On the downside, it continues to let cities levy income taxes. A good feature is it requires a majority vote of the citizenry to increase or add any other tax. I'd prefer requiring a super-majority but its at least a good limit. A nice summary from the proponents of the Fair Tax Proposal can be read at their website. From my review of the proposal language so far it seems like a tax proposal that would be a real win for Michigan to adopt. Certainly in this economic situation that Michigan finds itself in, bold tax reform would be a good start to get on the road to recovery. Obama also said he wants to install energy-saving light bulbs and replace old heating systems in federal buildings to cut costs and create jobs. How many Democrats does it take to screw in a light bulb? As a demonstration that this blog is not all Republican all the time, I indeed would heartily endorse The Sheriff of Macomb County, Mark Hackel, if he chose to run for Governor of this State in 2010. He's a different kind of Democrat from the run of the mill sort, Macomb Democrats typically are. I can say that he would make a great governor - he has true integrity, smarts, excellent presence, leadership and administrative skills and would not be a dogmatic sort but a practical and effective leader. He's done a great job as the head of the Macomb County Sheriff's Office and has proven he can assemble a very capable staff and handle a very demanding executive position. Given Michigan's recent electoral history of putting Democrats in the governor's seat (not to mention the legislature, presidential and Senatorial races etc), Sheriff Hackel would be the best one for the job. Until someone has been charged with a felony and remove them from office? Instead hire them with felony records at public expense. Wayne County Commission Chairwoman Jewel Ware is speaking out and standing behind her controversial practice of giving former felons a second chance on the taxpayers' dime. At least they come ready to work while in office right? Ware has carte blanche on hiring staffers for the panel. Since becoming commission chairwoman in 2004, Ware has hired seven people who are convicted felons, records provided to The Detroit News show. None still work for the commission or her staff. Most did not cause problems, but others were a thorn in Ware's side, including one staffer whose contract was not renewed after allegations arose of missing checks from the commissioner,. An interesting list of those she hired is on the Detroit News' webpage - charges range from larceny - an important qualification to have before taking public office, to multiple appointments for violent offenders including those convicted of 2nd degree murder, assault with intent to murder and other similar charges. Ware said Terrance Dortch and Kwasi Akwamu -- the central figures in the controversy, who also spent time in jail with her husband -- are being singled out for unfair treatment. Ware faces ,an auditor general probe of claims that Dortch and Akwamu were no-show employees who collected county salaries to work for her husband, Jesse Long-Bey, at his resort in Idlewild in northern Michigan. The investigation -- which will scrutinize payroll records of the commission's 72 staffers -- emerged after an anonymous letter was widely circulated that included the claims. Ware denies wrongdoing, saying some workers pitched in at the resort, Morton's Motel, on their own time. The Commission also pledges to support Detroit Mayor Kwame Kilpatrick on the city's new neighborhood re-development program. Wayne County will build on its many stregnths (sic), including its oustanding transportation network, its tremendous diversity and its strong work ethic. This looks good for Kwame, since he is now a convicted felon (with a strong work ethic), he can probably sign on to get a job with Ware and the County Commission once he's out. Oh, we can also play name that party, because nowhere in the article does it mention that she is a Democrat, but you probably guessed that by now. In a parting gift from the Bush Administration, after long foot dragging, the Department of the Interior has passed a regulation that concealed carry is allowed in a national park as long as the surrounding state permits such carry and if you're from out of state, recognizes your carry permit. Its not in effect yet but should be effective shortly. In a very well written Final Rule, the Department lays out the scope of the rule and rationale for it. While not perfect its certainly much better than the status quo and a major benefit to law abiding firearms owners and indeed to all visitors to such parks who will benefit from the positive externality of law abiding citizens being able to carry concealed firearms to deter criminal attack. LOS ANGELES (AP) - The rowdy Bratz dolls have been evicted. Barbie has regained control of the dollhouse. Toy giant Mattel Inc., after a four-year legal dispute with MGA Entertainment Inc., touted its win in the case Wednesday after a federal judge banned MGA from making and selling its pouty-lipped and hugely popular Bratz dolls. "It's a pretty sweeping victory," Mattel attorney Michael Zeller said. "They have no right to use Bratz for any goods or services at all." U.S. District Judge Stephen Larson rocked the toy industry with his order that MGA must immediately stop manufacturing Bratz. He allowed MGA to wait until the holiday season ends to remove the toys from store shelves. The decision was a stunning defeat for MGA, which exploded onto the tween scene in 2001 with the edgy dolls and made hundreds of millions in profits, giving Mattel's more classic doll-diva Barbie a run for her money. The ruling, issued in federal court in Riverside, followed a jury's finding that Bratz designer Carter Bryant developed the concept for the dolls while working for Mattel. The same jury later awarded Mattel $10 million for copyright infringement and $90 million for breach of contract after a lengthy trial stemming from Mattel's 2004 lawsuit ended in August. Mattel has fought to neutralize the Bratz line for years. The dolls - with their huge lips, pug noses, almond-shaped eyes and coquettish figures - were an instant hit with young girls. MGA had taken Bryant's original four dolls and spun out a line of more than 40 characters, complete with accessories and related toys such as Bratz Boyz, Bratz Petz and Baby Bratz. Coquettish - meaning "A woman who makes teasing sexual or romantic overtures; a flirt." Yep, that's just what you want preschool and gradeschool girls to be exposed to as a norm for dress and behavior. No thanks, we'll stick to the princess and doctor/professional/smart and appropriately dressed Barbie lines thank you very much. Mind you, I'm still waiting for CCW Barbie accessorized with a Glock, Sig, or PPK that all the best dressed, self-confident, and safe women are carrying these days. Once, Britannia ruled the waves, now British security gets rolled into the waves. The British security for this chemical tanker was of course unarmed. The company said it was aware of the incident on the chemical tanker it identified as M/V BISCAGLIA. "We have been informed by coalition military authorities that three of our unarmed security staff were rescued from the water by a coalition helicopter and are currently on board a coalition warship in the Gulf of Aden," the company statement said. Unarmed in pirated infested waters. That unarmed security certainly helped didn't it, must have been quite the deterrent effect eh? What happened did they say "Stop or I'll say stop again?" and the Pirates responded by saying "Jump?". I had a great Thanksgiving. We had some friends over and Natasha made a wonderful feast. We're still dealing with a few days worth of leftovers but I was restrained and didn't eat myself into a stupor. We do have much to be thankful for. Even with the economy in this state continuing to amaze us all by continually finding new lows, I've still got a job, we've got a (massively depreciating) roof over our heads, food on the table, two healthy happy kids and a good bunch of friends. Many people have much less and the majority of the world would be thrilled to have the opportunities we have living here and now. Yesterday the few, the brave, the foolhardy showed up at Union Lake at 6:45 for a dive. Rob G and myself, everyone else didn't show. So it was up to us. Visibility was 20 plus feet. It was dark with only our lights for illumination. Lots of big fish were hanging around the sunken boats, including some that decided divers were not a problem as they held their ground and would wait until you almost touched them before moving away. There was also some very large crayfish, including one on the bottom of one of the boats that looked almost as big as a lobster. We declined to catch any lakefood and instead just navigated from boat to boat and swam forth enjoying ourselves. Rob repaired a few of the lines that are strung underwater marking the diver navigation routes and I practiced my back kick and buoyancy, both of which keep on improving. By the end of the dive we were both on the decidedly cold side so after we got out we went to the Library Pub for coffee with a fortifying shot of Jameson's Irish Whiskey. A good way to end a good dive. On Monday the 17th, after work I volunteered at the Michigan Friends of the Israel Defense Forces fundraiser dinner. I worked on registration, checking off and making sure the people showing up at the event were actually supposed to be there. The event was a huge success - over 700 people showed up to participate and money was raised for the cause. MFIDF raises funds for medical, educational and recreational needs of Israel's soldiers, providing them with essential downtime and care during their fight in the everpresent war that Israel finds itself in with the Arabs. The honored guest was A Alfred Taubman - a very successful Jewish businessman here in Michigan, who not only was a pilot in the US Air Force in World War 2 but has done a great deal for philanthropy both here in the United States and Israel, and his honors are well deserved. -The second Israeli female combat fighter pilot, Lieutenant N. (Israel does not reveal Air Force officer's names and I'm not about to do so here). She is the second operational female fighter pilot and flies an F-16, aged 24 (I now feel old). In case you're wondering she had to do the same qualifiers as males to get her wings, including the famous 120 km solo land navigation escape and evasion exercise. I'm quite sure that any arab fighter jock that goes up against her will get the shock of his life. How embarrassing it will be for them to get shot down by a woman, and a Jewish one at that. - A captain in Sayeret Matkal, arguably Israel's best spec ops unit, Captain Y. (Israel does not reveal Special Operator' s names and you guessed it I'm not about to do so here). the Captain told us about his traingin, a bit about the Unit and a brief description of the non-classified part of an operation he took place in during the second Lebanon war - ie went in to Hezballah land, accomplished the mission, was ambushed on the way to the extraction point, fought their way out and made it back. With soldiers like these Israel is in good hands, and its good for us to help them as they're on the frontlines not just for Israel but for the West against the Islamic threat. So I heartily endorse the organization as they are very good at getting the funds to where its needed not spending on excessive overhead and the money really makes a difference. You can click this donation link to make a donation to the Friends of the israel Defense Forces, and I am certainly doing so. (I will post about another worthy charity to which I'm donating this year shortly). I don't condone this but I really, really, understand. Friday night in Columbia South Carolina, ex-law enforcement officer Ray Jackson lost his temper while trying to repair his girlfriend’s computer. After installing Windows Vista on the girlfriend’s 2 year old computer Jackson was trying to get some of her older programs to work with the new operating system. “He couldn’t get anything to work like it was supposed to”, said girlfriend Wanda White. “He just kept screaming at it and smacking the side of the computer”. White had heard enough cursing from her boyfriend and went next door to her friend’s apartment. After about 20 minutes White and her friend heard gun shots from the apartment where Jackson was working. ..... When she opened the door there sat Jackson with his pistol in his hand. He had just shot the computer 5 times and missed once. The miss had gone into the neighbors apartment and the bullet was lodged into their refrigerator. I'm certainly considering it, but even as it would be extremely cathartic, it would void the warranty pretty seriously. 1. Have a safe backstop (i.e. one that bullets cannot travel through like a concrete or brick wall). You are 100% responsible for where those bullets may end up, and they can pass through a computer and on to who knows where. Remember your enemy is the computer not some innocent bystander on the other side of a thin interior wall somewhere. Don't miss and be careful, Mr. Ricochet is not your friend. 2. It is much, much, better and safer for all concerned to do this at a shooting range, and there's less chance of you being arrested for firing a gun in city limits, reckless endangerment, or whatever other charge police can come up with to lock you up until you calm down. 3. Make sure it is your computer you are shooting, respect other's malfunctioning frustrating and worthless computer property. 4. The Lafayette shooter, in hanging the shot-up computer over the bar as a trophy had a stroke of pure genius, for that artistry alone the judge should let him off. 5. Save yourself the headache and don't get Vista (hard to do as they preload it on everything but its worth avoiding the trouble). As you can guess, this gorram HP Vista 64 computer is still not working. Even after 4 destructive rebuilds it still will without warning fail to boot as it finds some kind of conflict, then it does a system restore and removes whatever programs I've installed and remains unstable. I now know about half the technical support people in India, and I've finally made it to level two technical support after rebuilding this piece of crap 4 times. Make no mistake, the Indian techs are very nice and they do try to be helpful, and for the average problem I'm sure they're fine, but they start out on script and it takes about 20 minutes each for them to read the service ticket case notes and for me to explain what is in the note and that I've been through this already. I've done 4 destructive rebuilds including rebuilding off completely new discs they shipped to me, and the problem still keeps recurring. I'm now an expert at rebuilding a Vista computer and getting it to the point that it will crash with elan. Funnily enough when i ask if they have an XP image that is compatible with this computer they say installing X on it would void the warranty -- Ha!. I've now spent untold hours messing with this thing. I'm now trying to decide whether to return it to Costco completely or just ship the desktop box to HP and let them try redoing it. The problem of course is Costco no longer offers this same package with the nice big monitor and good hardware configuration it came with at this price (its been about 60 days of me messing around with tech support trying to get this to work) I have 30 days left to return it to Costco. And of course both Dell and HP and all other Costco computer vendors ship all their machines with Vista, and their better machines with Vista 64, so if its not some hardware conflict I'll probably see this again. Spit. Given the amount of troubleshooting and rebuilding, I'm seriously considering wasting more time and money and just building a computer from scratch. At least I'll be troubleshooting my own mistakes rather than Vista and HPs. When I spend extra and buy a computer from a manufacturer I do expect it to work and be stable, not to be a beta tester and constantly rebuilding the operating system. Yeah, cheap shot at a badly written headline, but appropos. Mind you all the expectations people have for Obama are getting to be quite something: heal the planet, stop the rise of the oceans, clean the great lakes, save the economy, make straw without bricks, make energy and gasoline without coal or oil, pay his workers for their campaign work, for every child a new pony. The letdown amongst the Obamaniacs when he can't deliver nirvana is going to be quite the spectacle. the composition of the Transition Economic Advisory Board also was announced, including not only Granholm and Bonior, long an ally of organized labor, but investment whiz Warren Buffett, a former Fed chairman and two former treasury secretaries. The group is set to meet today in Chicago with a news conference to follow. Among those attending: former Treasury Secretaries Lawrence Summers and Robert Rubin, former Federal Reserve Chairman Paul Volcker, former Labor Secretary Robert Reich, former Commerce Secretary Bill Daley and, from the business world, Buffett, Google chairman Eric Schmidt and the heads of Xerox, Hyatt and Time Warner. Granholm? Granholm? A Governor of a state that is leading the way in a recession, that had a one-state recession long before the rest of the country decided to join the party is who you want on your economic advisory board? A Governor who raises taxes in the midst of a state in recession, that leads the nation in unemployment and foreclosure -- that's who you want in your brain trust. Given her dealing with the recession in our state was by raising taxes and otherwise governing ineffectively and going on jaunts overseas, the mind boggles as to the advice she will be giving to Obama. Hold on America as it looks like your about to experience Pure Michigan. Granholm was right in five years you really will be "blown away". You will not be thanking us for sharing, really. Wow we're back to having the adoration of old Europe. ....But my best friend and training partner — who is French — just gave me his stamp of approval. "Will you wear your Stars and Stripes shirt now? You're allowed!" he told me. Don't expect this love fest to last. As soon as America acts in any way in its own interest, or contrary to old European interests (old meaning Poland and the rest of eastern Europe is probably not very happy right now), the deal is off. So the One Won, now what? Do we take the high road and congratulate the Democrats on their historic victory? Do we respond with vitriol in the same manner they did when Bush won in 2000 and again in 2004? Let's stick to the high road. Yes the Democrats won, regardless of if it was fair and square or if a goodly portion of it was bought and frauded for its done, now we have to deal with it. Interestingly, the victory itself is a damning indictment of the left's belief that America is a thoroughly racist country - after all the majority voted for a black man to the highest post in the land. That is no small thing and a good sign that in America anyone can truly make it to the top and we're still the land of opportunity. Let's stick to the high road, but with vigilance, no need to follow the Democrats down the derangement syndrome road. I'm quite sure that Fox News, unlike CBS will not run footage of the president speaking with the caption "Snipers Wanted'. Nor should it, we're not as crazy as the Democrats and a good thing to -- there were riots predicted if Obama lost - McCain lost and we all went to sleep, not into the streets. This is as it should be. Certainly Republicans should take time to regroup and rethink but should not roll over. Expect President Obama to come out of the gate swinging towards the bleachers in left field and be ready to stop or at least hold the Hope and Change Steam roller to a base hit rather than a home run. Be a loyal opposition, but loyal opposition does not mean be a bunch of cowed spineless jellyfish. The Democrats showed the way and turn about is fair play - filibuster in the Senate early and often, use the ideological test for judicial appointments, dissent is still the highest form of patriotism right? Holler loudly what effect each poisonous proposal is going to have on the economy and the government and get the message out any way it can. Fight to contain the damage as much as possible, and put the blame where it belongs. Don't give up, and strengthen the Republican bench and message for the 2010 and 2012. Quit putting up Bob Dole clones or media selected favorites (The media loved McCain in the primary but had no trouble turning on him in an instant once he won -- too old, temper etc right? funny how none of that was raised by the media in the primaries) and acting like Democrat party lite -- it doesn't work. Have a clear and positive message how the Republicans can be and are better for America, show how free market economics are the right prescription for the problems we face not this overegulation and misregulation and corporatism that caused this mess and quit campaigning with one hand tied behind your back out of some mistaken belief in the marquess of queensbury rules when you opponent disregards all rules in a quest to win. Give voters a cohesive program to vote for and be proactive not reactive. It is not over, it is just the beginning of new challenges and new chances. The country will survive 4 or even 8 years of Obama and hoepfully become the wiser for it. The left now has to govern rather than complain and they have no excuse if they make a hash of it anymore. The right has a chance to rebuild, move forward and regain its principles. May these challenges we are about to face lead to a stronger and better America. Details are sketchy but Right Michigan is reporting on voter fraud occurring in Pontiac, Michigan -- an Obama stronghold. Hijinks include excluding Republican poll watches from the polls and mixing provisional ballots in with regular ballots - making any audit or fraud investigation impossible. Combine this with intimidation by Black Panthers against non-Obama voters in Philadelphia and other frauds elsewhwere and this could be the high-tide (or the standard to be set for the future) of Democrat election fraud, where they put it all on the line to win. After all if you can't win fairly then cheat your way to victory as the ends justifies the means right? So this morning Natasha and I went to our Electoral Precinct to do our civic duty. The line was absolutely packed, with some recognizable neighbors. We were told by the lady at the door that the wait to vote was approximately 20 minutes. That was very approximate as it took over an hour. it was complicated by the fact that two precincts shared the same entrance and a ton of people had no clue which precinct they were in -- the precinct maps were of course farther inside past the line splits. This should not be that complicated - your voter registration card has your precinct on it and the Michigan Secretary of State Web page will let you look yourself up, check your precinct and even get a nifty example ballot listing all the candidates as they appear on the ballot. Proper preparation prevents poor performance you know. First there was the line where you fill out the voter identification slip - we did this while in line. Then you got in line by groups of last names for you to show id and get your slip checked. Then you got in line to get your ballot and then you waited for a spot to vote. Natasha commented that in the Soviet Union, with compulsory voting (if you didn't vote you were in deep trouble) it went a lot faster. I pointed out that back in the USSR you only had to vote and didn't need to choose as there was nothing to choose. She noted that was a good point. At least the lines remind us of the great efficiencies of government and if you love the efficiency of long waits in line to vote, just wait for the efficiency and long lines for government health care. Should be quite a race. Onethe interesting comments I heard two voters say -- these were a couple youngsters who were in voting for Obama -- they then asked "Do I have to fill out the back? (of the ballot). They were politely told its their choice to do as much or as little as they want and the ballot will still be ok if the back choices are made or not. I think most of us in line waiting wereof the opinion they should quit wasting time as if you're that clueless just vote and leave please and get out of the way of those who actually looked at the issues beforehand. Well the voting has been done, now to watch the counting and asociated punditry. It seems that every election becomes more and more crucial - and the polarization between the two sides becomes greater as the moderate middle is forced to give way as we face even starker swings to our lives at each electoral challenge. Part of the polarization is due to the fear of both sides losing their cherished rights and entitlements, and because the power of the federal government and its effect upon us all becomes more and more pronounced, so do our rights become in jeopardy as soon as the opposing ideology takes power. An unchecked Democrat dominance of the executive and legislative branches combined with the multiple judicial vacancies that such dominance would fill would be disastrous for the right and the middle as the left reshapes America to fit its image. Think the 70's only with more government spending, higher taxes and even lower thermostats in winter as our nations energy supplies are reduced by greenish extremism against coal and excessive taxes on oil with no viable alternative - certainly not the lefts bugbear of nbuclear power- provided to replace these energy sources. Think of Michigan's one-state recession under Democrat rule spread nationwide. this cherished and time-honored right to be left alone is in jeopardy and that my friends is un-American. Given Barack Obama's continuing lowering of his definition of the "wealthy" doomed to be subject to his taxation grab keeps dropping from 250,000, to 200,000 to 150,000 to 120,000 to 70,000 you're looking at paying even more of your income -- before you ever receive it -- to the government to pay for his massive expansionist plans. On top of that he will without a doubt let the Bush tax cuts expire -- that IS a tax increase - you'll know it when you go to pay your taxes. Given that Barack Obama is terrible on the 2nd amendment your right to own firearms is in jeopardy. He is for an assault weapons ban, for a national ban on concealed carry and multiple other restrictions and even confiscation. With a Democrat Congress there will be no brakes on these bans. Given we're still dealing with restrictions from the Clinton and Bush I eras, don't expect them to go away under Obama, or for them to put in a sunset clause this time. Expect leftist to push their agenda including gun control hard in the first 100 days of an Obama presidency. On the first amendment Obama is similarly bad in terms of those who are critical of him, including having supporters form truth squads to prosecute those who might speak out against him with "false criticisms". Do you expect this will really go away if he gains office? Given how the media is so in the tank for him that they're withholding negative video footage, audio, and stories about him do you really think they will fill their role as watchdog of the government or instead behave as loving lapdogs adoring their chosen one? On foreign policy Obama will be a nightmare - bringing back the 70s pattern of American appeasement and failure, complete with policy advisors (Brzezinski ) from that era as well. He seems set on betraying our allies abroad all to appease "world opinion". Much like someone in search of someone to say they're proud of him, indeed Obaam having grown up without a father will likely try gain his father's praise by pursuing his father's left wing goals, and the opinions and accolades of the international left wing will be a nice surrogate source of a father's pride for one seeming so in need of dreams from his father. Yes McCain has run a lackluster campaign, yes he is wishy-washy as all hell, reveling in being a "maverick" which generally meant going with the press and against other Republicans- but I think the press treatment of him has hopefully opened his eyes. Sarah Palin, a Jacksonian choice indeed for Vice President has at least given hope that McCain will not fall captive to the Democrats calls for bipartisanship (meaning do what they the Democrats want -- otherwise you're a bitter partisan meanie). In any event there is no repeat NO viable alternative to an obamanable four year period ahead other than voting for McCain Palin. McCain has the experience, wisdom and capability to govern reasonably and moderately and to face down the oncoming Democrat majority. Indeed, the left likely faces little risk to loss of their freedoms in a McCain presidency given his very moderate stance on just about everything. America under McCain will hold the line. My vote is for McCain, and I certainly hope yours is too. America will be far too out of balance with the Democrats so ascendant. I am not going to stand by and let these freedoms dissappear in the face of this leftist resurgence, instead I will vote for McCain, for America and for the preservation of the freedoms I cherish. Regardless of the polls or predictions or Obama's gandiose attempt to act as if this election is a mere formality -- it will not be so -- if you do not give up hope, you do not sit on your hands, you get up and get to the polls and vote. its not over until its over, and maybe not even then. I've added a new list to this blog, a list of books on ancient coins that I deem are essential for a serious collector of ancient coins. Seaby Roman Silver Coins and their values Volume I. If you plan to collect Roman Silver coins, the set started by Seaby that covers all Roman Silver coinage from the republic to the fall of the empire is absolutely vital. Excellent descriptions, pictures, values and cataloging information. Now expanded to three Volumes, Sear's Roman Coins and Their Values is the bible for the Roman Coin Collector. If you can find get the previous single volume 4th edition from 1988, it is nice and portable for taking with you to coins shows and auctions, even as the prices are long out of date, the relative values remain pretty much the same and you can adjust accordingly. If you plan to venture into more than just silver Roman coinage and include the bronzes or gold coins in your collection then you really need David R. Sear's Roman Coins and Their Values to get the most out of your collecting experience -- not only to avoid expensive mispurchases but to also learn about the history of the coins you purchase and to catalog them in a meaningful way. Image copyright Andreas Pangerl, www.romancoins.info used with permission. A silver denarius of the Roman Republic dating to approximately 63 B.C.E. Obverse (not shown): veiled bust of Vesta facing left, kylix behind. This coin commemorates the passing of the lex Cassia tabellaria, a law related to the method of voting in Roman elections that was passed in 137 BCE by and ancestor of L. Cassius Longinus, L Cassius Ravilla. L. Cassius Longinus was an ancestor of C. Cassius Longinus, he, the Shakespearean Cassius of "the lean and hungry look" who was one of the assassins of Julius Caesar. 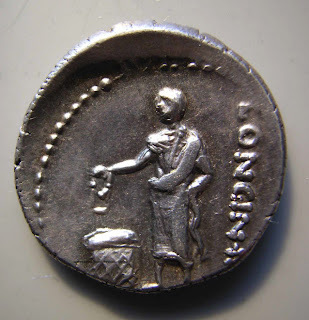 A very timely coin post, given how important elections were in the Roman Republic and now that this coming Tuesday we face a momentousness election in troubling times, times of troubled money markets and financial and political crises. Take your time to learn and understand the issues and candidates, and vote your conscience, calculations or political beliefs accordingly. Of course the destructive recovery done last week didn't last for long and didn't fix the problem. After backing up all my data and doing a destructive restore things started off rather auspiciously. Programs installed without issue. I restarted after each program was installed to see if a certain program was at fault. No problems. Everything went on great, it looked like I had all my data back and programs rinning fine. The HP update ran. I foolishly accepted installing the updates it recommended for the computer. Yep, after the restart, straight to the black screen of death. Every program installed since, every Microsoft update installed since causes the same thing. So I called HP support again. Of course, they have no record of the online chat assistance or the service call I made last week. After discussion with the tech, they've decided since I already did a destructive software recovery from the partition they will ship me the recovery by disc. So I get to do a whole new reformat. Anybody want to place a bet on whether this fixes the problem? Given that I had XP running on a system for about 7 years without having to reformat without this kind of trouble I certainly can't recommend Vista 64 for anyone at this point as in less than 2 months its been causing all sorts of issues. On the upside, I'm getting really good at backing up and restoring my data grrr. You know how the Democrats are the evil party and the Republicans are the stupid party? How when they come together and do something both evil and stupid its called bipartisanship? Congressional leaders and the Bush administration reached a tentative deal early Sunday on a landmark bailout of imperiled financial markets whose collapse could plunge the nation into a deep recession. House Speaker Nancy Pelosi announced the $700 billion accord just after midnight but said it still has to be put on paper. "We've still got more to do to finalize it, but I think we're there," said Treasury Secretary Henry Paulson, who also participated in the negotiations in the Capitol. The report is very short on details and hopefully we'll find more about what we've just had done to us shortly (likely too late to do anything about it), but for now hang on its going to be an interesting ride. Speaking of crashing like the housing market, here's a decent video as to one of the causes of the current mess. The cause outlined in the video -- the Democrats revamping of the CRA and pushing banks to lend to those who could not really afford home loans in the first place is not the only reason, but it does seem to be the spark that began the fire. Once the CRA and government led housing boom started, then coupled with the irrational belief that houses would always go up dramatically in value encouraging both quick flips and people buying homes they couldn't afford hoping the increase in value would let them refinance and have massive equity growth, we got to where we are today. Once this irrational belief was fixed Fannie Mae and Freddie Mac encouraged ARMs and 100% loans to get more people owning houses causing values to rise as demand went up. Investment bankers went along, coupling this with quick sales of loans and then repackaging them into securities that were sold to others and it got worse from there as they then leveraged these securities beyond any rational limit. In short, the government and high-finance wizards played with our money, got rich on bonuses (or campaign contributions and sweetheart loans in the case of the politicians), and we're left to clean up the mess. Sorry but the bailout is ridiculous in its current form, and even more ridiculous that Frank and Senator Dodd (both recipients of Fannie Mae / Freddie Mac largess and proponents of the policies that caused this mess)are inserting into the bill that 20% of the returns from the bailout does not go back to the taxpayers (or even the government) but to housing advocates such as ACORN - you know the people who helped start this mess in the first place. Nice. This computer is crashing like the housing market -- with no bailout in sight. Everytime Windows does an automatic update, on the next shutdown and startup it fails to boot, requiring a hard turnoff then it starts windows repair and then works. In search of a remedy I contacted HP technical support. After describing the issue here was their "brilliant" solution -- turn off windows automatic updates. Anyone see the problem with this "solution"? While it will stop the system from crashing on a weekly basis, now if I manually update I expect it to crash again.. its not a solution but a problem avoidance technique. I beginning to think the problem is Windows Defender update as that seems to be what was updated yesterday before the system crashed again. Anyone know if Defender updates are known for this problem? Its always interesting to look at the financial prognostications of yesteryear in light of the present. Such as: the investment return projections are based on 10% annual returns from the stock market - good luck with that. We haven't seen that kind of return in a long time. He also fails to point out that when you have a 50% loss in the market for example, you need a 100% growth to just get back to where you started from. The real estate advice was great pre-crash but he sure didn't anticipate this mess. His book is full of 0 down mortgages, buying houses for flippage etc. Ie buy it and watch the ridiculous amount of appreciation make you wealthy. The problem is that kind appreciation was anomalous - great if you were doing it then and got out, but otherwise once the music stops you're in trouble. Combine this with banks and mortgagees all doing the same approach on this belief of unsustainable returns as normal, couple it with a little regulatory capture from Freddie Mac and Fannie May and you get the mess we're in now. Its a good read but the current state of the market and real estate fracas just made large chunks of the book historical curiosities. So after 8 years of my home computer I decide its time to upgrade. The olde computer was built by Scott Reschke of Frag Center (If you're ever in East Lansing and like to play computer games his place is the place to go). It gave great service but lately is developing an atittude and it is getting slow. Unfortunately he's not building custom machines anymore and he gave me a few suggestions as to what to get. I end up purchasing an HP Pavilion, AMD Athlon dual core with 4gb ram, 500 GB hard drive and a monitor that came with the package that is ridiculously big in size. Looks nice. It also comes with Vista 64 Home Premium on board. So far so good. 1. Adobe flash player if installed as a plugin to Firefox 3.0.1, or even downloaded direct from Adobe's website and then installed crashes Vista completely - we're talking the black screen of death, Vista repair runs and removes it and the computer restarts. This was not a fluke as I tried it multiple times and same result each time - install flash player and the computer gets it. Interestingly, and weirdly enough, flash player exists and works just fine in IE with no ill effects and it is not removed in the repair. Since I really like Firefox, this is a major annoyance. 2. Thunderbird - Vista seems to pluck Thunderbird's feathers, I install it, copy over the mail, and it looks like its working, after some tweaking. I then upgrade Thunderbird from 0.7.2 to the latest version and it stops working cold. Still have not resolved this one and my mail archive is stuck in it, which is not good. 3. Vista 64 is not backward compatible with a lot of my programs - my old, paid off, lovingly functional Photoshop 7 and Premiere 6.5 will not work so I'm going to eventually have to buy replacements for what was some darn nice and comfy software, and I hesitate to try and install my old reliable Microsoft Office 2000. Thankfully Canon is on the ball and their camera software has an upgrade you can download as the software that comes with the SD1000 flips out on Vista 64, so that critical bit works for the pictures at least. 4. Every so often Vista does an automatic update of some Microsoft Vista or related product in the background and without notice, the machine restarts and bamn - back to the black screen of death with a required manual shutdown, windows repair and it sometimes repairs it and sometimes it takes everything short of lethal force to get it back to rights. I can find no log entries of these errors so it is a pain to track down what is causing it. In short this operating system is way less stable that XP and that is simply unacceptable and aggravating. A. It is much, much faster than my old machine. I can actually multitask without slowing everything to a crawl. Working with video I've shot is a lot quicker. There is a real speed difference and it seems to handle memory leacks much better. B. Installation of hardware is real nice, great ability to pull drivers, my Suunto Vyper Dive computer USB cable was recognized no problem, which is a huge improvement over the install process for it in XP. Wireless setup is a snap, adding peripherals like the camera, USB Hard drive is similarly easy etc, they've clearly improved the driver architecture. C. Most of my applications and data transferred over with no issues. So its a toss up. The lack of stability is the real killer though and certainly adds to the discomfort level as you never know for sure that when you turn it off you can get it back on again. If it was stable with a few issues is one thing, the instability however is not giving me warm feelings toward Vista 64. McCain made an inspired choice when he selected Sarah Palin as his Vice Presidential candidate. In one fell swoop he energized Republicans and made them excited about the campaign, after being unenthusiastic having McCain the ultra-moderate in charge. He not only succeeded in exciting Republicans and naming a very capable first woman as the first vice presidential candidate of the two major parties, but he also was able to have the Democrats collectively and figuratively wet their pants in panic. An erudite, capable, conservative and Republican woman? suddenly Barack's "safe" and uninspired choice of business-as-democrat-usual Joe Biden lost its appeal and any gains Biden brought to the ticket were well and truly blasted away. Democrats see the race, which is by any reasoned analysis theirs to lose, beginnning to well, lose. This of course brought out a series of quite nasty attacks on Palin. One of the stranger attacks was brought by Michigan Governor Granholm's husband Dan Mulhern after stating "This girl is going to go through a lot and does she know what she's putting her family through". -- The old women with kids should stay at home canard -- brought to you by a Democrat no less. And not just any Democrat -- as noted by Michigan Republican chair Saul Anuzis "One wonders if Dan Mulhern forgot the fact that he's only got a job because he's married to the governor, who also happens to be a working mom," Michigan GOP chairman Saul Anuzis said. Oops. Its funny that it is the Republicans that are "breaking the glass ceiling" so to speak and the Dems, the self-proclaimed party of feminism that is coming forth with all the old chauvinist remarks. For a darn good analysis of the reasons why the Dems are losing it over Palin. See this article by Victor Davis Hanson (who not only is a great commentator but is a fantastic classical historian -- if you like ancient history his books are must-read material) -- Works and Days: Target Palin. This election just got interesting. Investigators say a large black bear raided a clandestine marijuana growing operation so often that it chased the grower away. Deputies found food containers ripped apart and strewn everywhere, cans with bear teeth marks, claw marks and bear prints across the Garfield County camp on Tuesday. ...the operation on Boulder Mountain included 4,000 "starter" sacks of pot and 888 young plants. "This particular bear apparently was not going to give up and basically chased these marijuana farmers away," (Sheriff) Perkins said. "Our county is so tough on drugs that even the wildlife are getting in on the action." On Saturday we awoke at 4:30 and piled in the car and were on the road by 5. After stopping at an open diner in a small town on the way for a filling breakfast we drove into port Sanilac and the marina nice an early . Once again we went with Rec and Tec Dive Charters - simply the best. We first dove the North Star. A steel steamship that was 300' long. It was built in 1888 in Cleveland, OH. The ship is in two pieces but lies in an upright position. The pilot house is intact. The wreck is located about 5.5 miles SE of Port Sanilac and 10 miles NE of Lexington. The ship sank in 1908, after a collision with its sister ship the Northern Queen. Visibility was bad, about 10 feet or so for this dive and my camera does not yet have external strobes so the pictures did not come out well at all. Lagniappe's Keeper had a little issue and we had to break the dive off early and get back to the boat. A nice wreck and I hope to return again when there is better visibility to truly appreciate its enormity. After a surface interval we went to the Regina. I had first dove the Regina earlier in the year. Quite a few other dive boats came by to dive the wreck and after our surface interval we headed on down. The visibility was considerably worse than it was back in May, again about 10-20 feet or so. There was also a nice current flowing from the stern towards the bow so getting back to the boat anchored on the stern (by the rudder for you non-nautical types out there) after the dive took a bit of work. The dive however was worth it. Here's Lagniappe's Keeper by the wondefully huge propellor and rudder of the ship. We also checked out the huge smokestack lying beside the ship and peeered into the great crack in the ship's hull. After making our way kicking back to the stern thought the very visible current (particles in the water were really flying by, sadly opposite to the direction we wanted to go) we did our nice slow ascent and returned on board without incident. A great way to end the day. Simply an excellent couple of wreck dives,Rec and Tec has never disappointed yet. On the charter we met some very nice divers from the Ford Sea Lancers Dive Club that had the other 8 of ten spots on this trip. A good bunch of divers to be in the water alongside with. Then the long trip back to my house for a festive BBQ with the family and folks.